Zafferelli has a new lease of life with a brand new Italian regional menu based on their grandma’s recipes created using the best quality suppliers and aiming to be organic where possible. By focusing purely on food and ambience, Zafferelli provides the authentic feel and simplicity of an Italian restaurant. Zafferelli loves their diners and the environment and now the Italian Family’s restaurant has teamed up with Carbon Free Dining, the United Nations-backed Restaurant initiative. At their location in Brighton, they have chosen to demonstrate their love for the environment by partnering with the initiative. 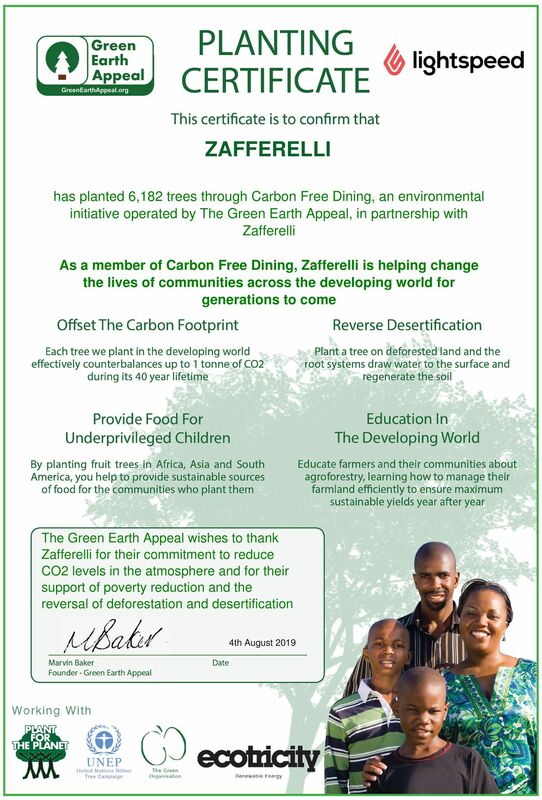 As a Carbon Free Dining Certified restaurant, Zafferelli plants hundreds of trees each month, effectively counterbalancing the Carbon Footprint of the meals they serve. This is done by simply giving diners the opportunity of planting a single tree with each bill for an optional 99p.